PlugBug is the latest iOS accessory from Twelve South. 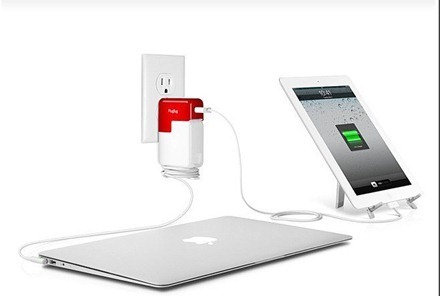 It’s a travel charger for the iPad or iPhone that slots right into a MacBook power adapter – saving space and plugs. Twelve South are the makers of a number of excellent and elegant accessories for Mac and iOS devices. I’m a huge fan of their versatile compact Compass Mobile Stand for the iPad and iPad 2 and my wife is currently deeply in love with their BookBook case for the iPhone 4. So why is PlugBug red? Noted author and original Mac Evangelist Guy Kawasaki gets credit for the color. When shown an early prototype, Kawasaki insisted PlugBug should carry a show-stopping hue viewable from across the room – or airport. The "Kawasaki Red" PlugBug was born. This looks like a very handy travel accessory for any of us who use both a MacBook and an iPad or iPhone (or all three). It even looks pretty useful to have around the house – I know I’m always running out of slots on power strips round my office area, so every one saved is a very good thing. I’ve order a PlugBug today – so no doubt I’ll soon be letting you know what I think of it once I’ve seen it in action. In the meantime, if you want lots more detail, including an intro video, or to place an order, visit the the PlugBug product page.